Boots is hoping a stress coaching service it has used can be expanded to all pharmacists, the multiple has told C+D. 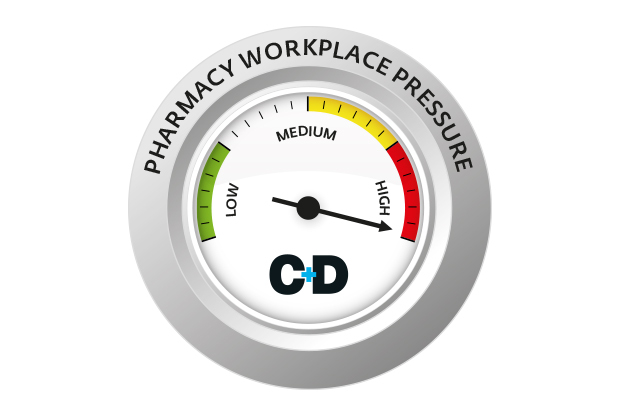 Exclusive data from the C+D Salary Survey – presented to England’s chief pharmaceutical officer Keith Ridge last month – revealed that stress among pharmacists rose six percentage points from 2016-18. When asked by C+D how Boots is addressing stress among its employees, the multiple’s pharmacy director Richard Bradley pointed to a wellbeing steering group, pharmacist mental health first aiders and its “five ways to wellbeing” initiative. The multiple has “started discussions with colleagues in the University of Manchester, who are looking at this important issue”, and has “shared our experiences, resources and learning with other community pharmacies in the UK”, Mr Bradley said. “While this goes some way in addressing the symptoms of a busy workplace, we understand we need to address the causes too, and welcome any work to look at the causes of stress in community pharmacy, and to find solutions for our pharmacy teams as a whole,” Mr Bradley added. Well has also told C+D how it is tackling stress, including its own initiative with Pharmacist Support. Lloydspharmacy told C+D it would not comment on how or if the multiple is tackling pharmacist stress. RPS English board chair Sandra Gidley – who passed C+D’s stress data to Keith Ridge – has said the society wants NHS England to fund a pharmacy version of the GP Health Service. Read C+D’s analysis of this service and whether it would be a good fit for pharmacy. What did C+D’s stress findings show? The document also highlighted the impact of stress on the public in 2018, with 34% of the 1,067 pharmacists who responded to last year’s survey saying it had the greatest effect on their service to patients. Could a mental health service help pharmacists under stress? Is workplace stress affecting you and your patients? Boots are on record stating they use a formula to ensure they have the correct number of staff in store, but hide this due to it being a "trade secret" - but would be easily worked out with a little bit of mathematics. Why doesn't Boots show a level of openness, in comparison to what appears to be disingenuous lip service? Why would they need stress coaching when all is well in all it's branches? complete waste of money surely ?! Interestingly the headline of this story has changed from /boots-make-stress-coaching-service- available-all-its-pharmacists to Boots hopes stress coaching could be offered to all pharmacists after someone pointed out it isn’t true in the comments. Have C&D misinterpreted the story or have Boots been called out in being untruthful again ?? One company is offering stress coaching. Another states a 36% reduction in stress. Why do they not offer more staffing instead of potentially dangerous working conditions? It is staggering the journey of a professional and supporting staff being at the centre of the community over the last ten years. The reduction in the global sum and below inflation remuneration is exacting the proverbial pound of flesh in more than one way. Why did some pharmacists fake the MUR numbers? Why have some individuals been arrested on possible illicit POM trading into the black market. The change in finances and working practice are surely a driving factor in negative behaviour change. Forget the GPHC. They are not interested. I thought being honest and having integrity was key to being a pharmacist?? Richard Bradley is either breaching every professional standard in that regard or is deluded . The company policies, lack of staff and lack of professional respect from him and his so-called leadership colleagues are the cause of this stress. It’s why they are fighting so hard to stop the PDAU being able to represent those poor souls !! Absolute hypocrisy- good job they no longer have that ‘Who cares .....’ campaign because they sure don’t ! Hi Richard, you look baffled. Yep, you've got no staff. This company is such joke*. I gonna save my breath critising about this company otherwise this will be a 3000 words essay. * Bye Boots you will not be missed, and go back to America with your shambolic parent company Walgreens! Having worked for Boots previously for six years the staffing levels being woefully inadequate was the main issue, particularly having suitable staff holiday cover when levels are at breaking point even with a full team. The layout of dispensaries with pharmacists on the 'front line' does not help anyone. It just means constant interuptions from customers whilst checking or dispensing prescriptions basically on an open front counter. I am all for pharmacist spending more contact time with patients but this does not mean the dispensary should be completely exposed to the shopfloor. In terms of finding time to spend effectively with patients its not possible when you are constantly trying to battle with the 'managed prescription' reordering system. The system is a joke causing massive amounts of extra workload. The benefit for patients is minimal for the majority especially in the age of eps and patients being able to order their own medicines at the click of a button. Other than a huge workload and more complaints from patients the only result in most cases is unecessary ordering of prescriptions with patients then being texted who then come to collect them and may not inform the pharmacy they have a huge stash at home already. So despite most pharmacists trying to manage orders responsibily this 'automatic managed repeat service' is not the way forward. Boots talk about managing stress, well for a start allowing pharmacists a tiny degree of flexibility and choice with booking holidays would go a long way. Lol. I left this joke of a company after my Pre-Reg year and swore never to return and I never have and even if I was desperate I would never work for this pathetic company. Not being paid for the first three months of your Pre-Reg year and being stuck in a dark room just doing dosette trays will do that I guess. Funny I’m sure I was supposed to be recieving training on how to become a Pharmacist? Anyway....stress coaching eh? Haha I can see it now...couldn’t get 20 MURs and 50 NMS sign ups this week? I tell you what try and get half, there’s a good Pharmacist *pat pat*. Funny how this is an acknowledgement that they do stress out their pharmacists. Let me save you a bit of time and effort looking for the causes of stress, Mr Bradley. * For starters, how about you make sure your branches are staffed appropriately for the workload they are asked to do. Am pretty sure that will help massively with reducing stress. You're welcome. Exactly what I was going to say! Correct staffing levels and more focus on the patient not targets... More appropriate training for the staff as well - not pushing the newest mascara training on someone that works behind the Pharma counter - we don't care!